Occupation: Student. Schools/College Attended: Cola¡iste An Spioraid Naoimh and UCC He first began to play hurling out in the back garden with his brothers and sister when he was about 4 or 5 years of age. Best career advice given to him was to keep your eye on the ball The skill he think is the most important in hurling is striking off both sides. What he would like to occur in the game is the Standardizing of the sliotar. Biggest influence on his hurling career have been his Father / underage coaches in Ballinhassig. The sporting event he would most like to attend is the Champions League Final. 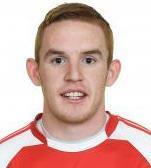 To date his favourite moment in sport is Cork Winning the All Ireland in 2005. Favourite Venue: Thurles. Favourite G.A.A. player: T.J Reid. Sportsperson he would most like to meet is Conor McGregor. The hardest part of his sporting life is Winter Hurling. Toughest player to mark in training, he wouldn't fancy any of them to be honest. The joker on the panel is Pa Keane. If he won the lotto what first thing he would buy is around the World Ticket. Favourite holiday destination: Spain, Favourite Food: Chicken Curry, Favourite Drink: Chocolate Mooju, Favourite Music: RnB, Favourite Film: Invictus, In ten years timeheI hope to be: Happy and Successful in both sport and work One thing you may not know about him, Hate being late!